Right now, I'm in a creative writing class with the inimitable Kristin Abraham. 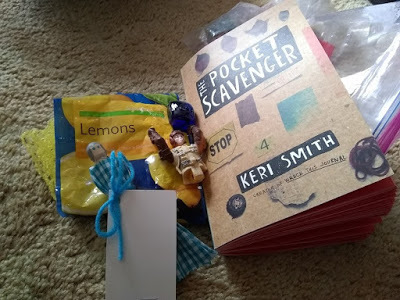 One of our assignments is The Pocket Scavenger, a quirky little book that asks you to find everything from "four squares" to "something that was given to you" to "a hair sample." I'm about ⅔ of the way through the hunt. What is fascinating to me is how everything seems to turn into a writing prompt. Every bit of detritus I've stuffed into the pages and the Ziploc bag that holds it together sparks a story. The four square pieces of decorative glass from my writing cabin recalls the hours my husband spent wiring and drywalling a bare garden shed for me. The hand-painted watercolor bookmark was given to me by an inebriated man in a bar at Denver International Airport. He carried a briefcase full of them and said he handed them out when he thought someone needed one. I've got more than a "sample" of hair -- it's a giant hunk from the first time my hair was cut short when I was seven. It was in a box of keepsakes my siblings packed up from the house after my parents died. I screamed when I pulled it out. Kristin, be forewarned. And be grateful a dear friend reminded me that I couldn't use the stitches from my mole removal for "something on your body" due to the whole bloodborne pathogens thing. bit of a pain in the orifice. For "something that was discarded" I saved a label from a bag of lemons. I sent my husband to the store for three lemons to make ONE pie, and he returned with an entire bag because "they were cheaper." Twice as much as I needed, so in a short few days he started making noises about baking a second one to use them up. Wouldn't want them to go bad, after all. I smell an ulterior motive for his hidden agenda. 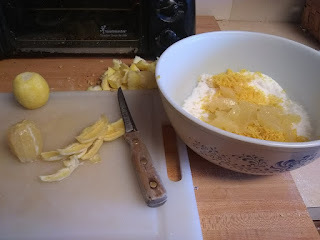 I also smell lemon pie baking right now. This project has opened my eyes to the abundance of stories that has been right under my nose all this time. The book has a few lines for each item to tell its story. For most of these, I could go on for pages. I clearly have little patience with drawing maps. 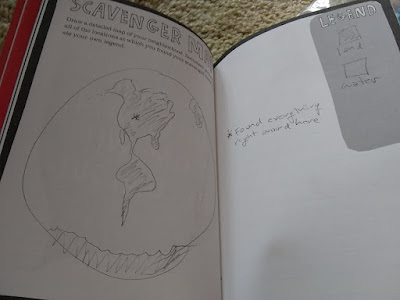 I'm not entirely sure I'm doing this scavenger hunt exactly as the author intended. I get the impression she envisioned her dear readers donning clothes with ample pockets and heading out to explore the world. She even has a space to draw a map. I turned inward, instead. As I went down the list, I would think, "I have that. I know just where." Another lesson for my writing, indeed. I have what I need already. I don't need to look outside myself. I don't know about you, but some days I feel blank, devoid of stories to write. Maybe after this experiment, I'll look around and fix on one item. Maybe one I've had so long I've ceased seeing it. I'll bet dollars to donuts it contains a story. I'll invite you to do the same. Let me know how it goes.